You can learn the correct equipment to use, trail etiquette, nutritional information for human and dog athletes, training program ideas for human and dog athletes, dog care tips especially for paws, learn about various places to train, clubs and races you can try. The clinic will tailor to the needs of the individual who come, focusing on the topics they are most interested in. Karen Koehler has been teaching people how to do activities in the outdoors since 1997. 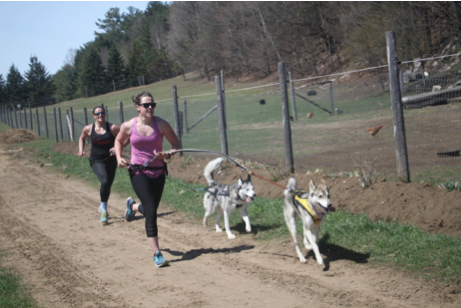 She is a director of the Canadian Association of Harness Dog Sports, and past president of the Ontario Federation of Sleddog sports (OFSS). She has instructed adults and youth at OFSS and FQMECA club events, and taught private lessons for OFSS. She helped bring the 2017 International Federation of Sleddog Sports, Winter World Championship, to Haliburton Ontario, where she competed and placed as top North American female in two events. She competed at the IFSS 2015 Dryland World Championships in Bristol QC. She also competed in IFSS World Championships in Germany, Alaska and Norway. She began competing in harness dog sports in 2004 when she adopted her beloved first dog, a retired sled dog named Robbie. Check out Yours Outdoors http://yoursoutdoors.ca/packages/dog-days-summer for more information including prices. Must be an OFSS member to participate in all activities. OFSS Membership can be purchased at Killara Station on September 8th or 9th. Some equipment is available for rent and purchase. Inquire with Yours Outdoors. (Things will begin at 8:00am but some adjustments may be made based on numbers and temperature after 11:00). Accommodations can be made to include people who are level 2 if they can only come on Saturday. (Things will begin at 8:00am but some adjustments may be made based on numbers and temperature after 11:00). Accommodations can be made to include people who are level 1 if they can only come on Sunday. 1:00-2:00 Prediction Race Prediction Race (Pick any style of racing canicross, caniwalk scooter or bikejor and predict the time it will take you to do 1 or 2km. Top 3 closest to their predicted time are the winners.